Rare has released Sea of Thieves update 1.0.7 for Xbox One and Windows 10 PC, which adds the ‘Open and Closed Crews’ feature to the game. The update is somewhat smaller than previous updates, and clocks in at 800mb on all platforms. Aside from the above mentioned new ‘Open and Closed Crews’ feature, the patch also offers fps improvements due to visual effect optimizations and allows players to lock the framerate to 100FPS. In addition, latency has been improved due to server optimizations. This Seat is Taken – Players now have two crew type options available to them, Open and Closed Crews. Open Crews: This option works in the same way you’re used to. For the Galleon, an open crew will match four players together while also replacing players who leave during a game. For the Sloop, two players will be matched together, with a leaving player being replaced when possible. Closed Crews: This option allows a single player to begin a game on either a Galleon or a Sloop, allowing friends to join in when they’re available. You can now play with any configuration of players up to the limit on each ship, which is 4 players on the Galleon and 2 players on the Sloop, as well as preventing non-friends from being able to join you. This option replaces the 3 player Galleon and Solo Sloop options in the Main Menu. Coming Soon: Additional functionality coming soon for Open and Closed Crews includes the ability to dynamically switch between Open and Closed while in the game, in addition to being able to make a session fully private by preventing friends joining. Here, take this! – Imagine the scene, skeletons surround your crew, your crew-mate has been bitten by a snake, they have no bananas and there are no resource barrels in sight! Now you can help them CRONCH their way to full health by handing them a banana! This also works with wooden planks and cannon balls. You helpful pirate you! Who Goes There? – When swimming underwater, gamertag and Player Titles are no longer visible. Now you can #BeMoresneakyPirate! Now in Stock! – Imperial Sovereign Blunderbuss, Pistol, Sails, Hull and Liveries are now available to purchase in the Ancient Isles. They were incorrectly listed as available in Patch 1.0.6. Flintlock Pistol – New sound effects for close fire and reloading the Flintlock Pistol. Icons – Within the clothing chest, the icons to unequip all or select a random outfit have been updated. Health Bar UI – Deciding whether to eat that banana or keep swiping your sword? You’ll notice some changes to the health bar UI, fancy! Price Changes – Greedy pirates had overpriced the Castaway Bilge Rat weapons and ship liveries. These have now been reduced. Anyone who purchased items within this set pre-price adjustment will have the difference reimbursed very soon. 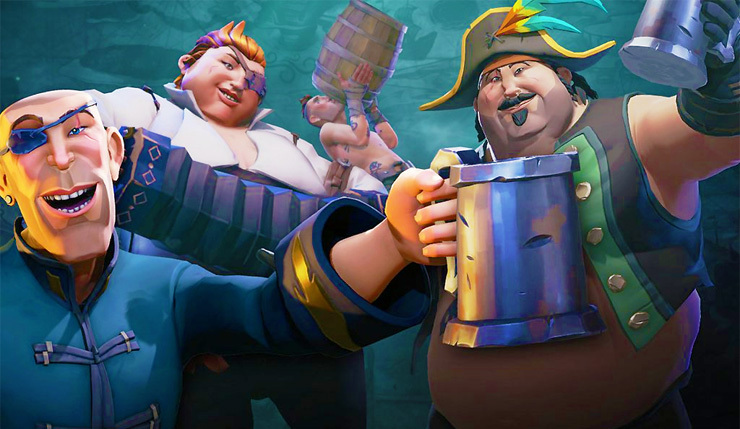 Strike Gold – As Pirates rank up with the Gold Hoarders and Order of Souls trading companies, the chances of finding more valuable rewards has been increased. Say good-bye to those Castaway Chests at higher ranks! Players should no longer experience details of their pirate (such as hair colour / scars) looking different from their initial selection. Players should no longer experience delayed achievements and commendations from in-game actions. During last week’s maintenance window we made improvements to our servers and services which should have resolved both of the above issues. If you are still encountering the above two issues, please log a Support Ticket so we can investigate this further. Resolved issue that sometimes showed riddle landmarks as glowing rocks. Resolved an issue on Faithful Isle which could have prevented players from completing riddle voyages. Bounty Captains and Crew will no longer have their names mixed up. Gunpowder Barrels will no longer cause two explosions if detonated when being held by a player. Loaded cannons will no longer intermittently appear unloaded when returning to the ship. Starting Merchant voyages back to back will no longer prevent the reminder to collect crates from appearing. When playing on wide monitors the settings menu UI will no longer have clipping issues. Being on an Order of Souls voyage no longer causes fewer ambient skeletons to spawn. Cannonball, wooden plank and banana crates no longer always spawn empty. Restarting the game will no longer reset the frame rate lock option. Fixed a collision issue on Thieves’ Haven. Equipping the Seadog Hull on a sloop will now match the preview image. Muting all other crews will no longer mute your own crew. The floor texture of the crows nest on the galleon now appears correctly. Resolved a shader issue caused the balcony outside the Captain’s Cabin on the galleon to appear incorrectly. There is no longer a gap between a characters head and the Imperial Sovereign Hat when it is equipped. Restored missing 90 fps frame rate lock option. Frame rates will now be more consistent during ship battles, sword fights and Kraken encounters due to visual effect optimisations. Latency has been improved in multiple-ship and skeleton heavy scenarios due to server optimisations. Frame rates can now be locked to 100 FPS. [PC Only] Fixed GPU driver hangs/crashes on certain graphics devices. [PC Only] Resolved bug which triggered Copperbeard error when alt-tabbing. Once you redeem your code, here is a Support Article that shows you where to find your items in game. If you still cannot find your items in game, please raise a support ticket to log this issue. Sea of Thieves is available globally now for Xbox One and Windows 10 PC.